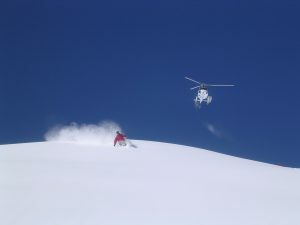 For many a skier, heli-skiing is the dream. Visions of endless powder fields, untouched snow that people can only dream of, and the glamour and rugged extreme feeling of being transported by a private helicopter. Even writing it sounds darned cool. Personally I am now envisioning myself as a Bear Grylls (female version) mountaineer. In reality I look a lot less polished when jumping, well…anywhere! All of the recent snowfall is making me dizzy and romantic. If you own property in the French Alps you’ll no doubt know various parts of the heli-skiing laws, but probability is that, like me, you don’t know why the laws exist and what the loopholes are! 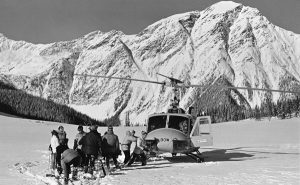 For a bit of history, the first person to heli-ski was Austrian born Hans Gmoser who lived in the Bugaboo Mountains in Canada. Gmoser was a pioneer in mountaineering and discovered many of the skiing, hiking and climbing routes which are still to this day some of the most popular routes. A loss to Austria, I think we can agree! 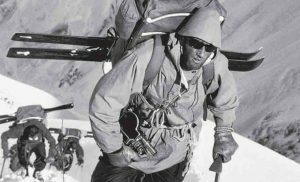 In 1962 he used a chopper to take people part way of a ski trip, but they still had to spend hours trekking to reach the summit. Et voila, the idea was born. The first heli-trip actually happened in 1963, in a Bell 47 B-1, a plane which had a 178 horsepower engine, and could just manage 2 passengers. They strapped the skis to the skids with bungee cords! Credit: Whyte Museum of the Canadian Rockies. Life continued for mountaineers and heli-skiing was rolled out across not only the Canadian mountains but worldwide, including France and the rest of Europe. 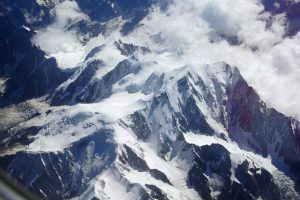 It wasn’t until 1980 when French President Valerie Giscard heli-skied Mont Blanc. Following the 3800m vertical descent he was met with a group of protestors against heli-skiing due to the environmental impact it has. The argument was that heli-skiing has a huge environmental impact due to the noise it creates and the damage it does to the landscape, and this impact didn’t reflect the number of people who could benefit from the sport; and you can see their point! Following this, the president banned heli-flights in the Massif region. When the following President, Francois Mitterand came into power he rolled out the ban to the whole of France, becoming Article 76 of Law 85, stating that helicopters were only allowed in France for work, transport or rescue. It has been that way ever since. 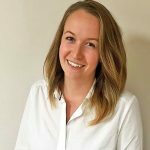 There was rumour in 2016 that Minister of Labour, Agathe Zepower had started working with the ministry to re-introduce heli-skiing in France to the country’s benefit, and only using French designed and made helicopters, so this is something to watch out for. However, and what we’re all really interested in, is loopholes! Of course! As with anything there are heli-skiing loopholes and those of you who have heli-skied in France will have discovered and utilised them already. Because we’re so closely bordered with Switzerland and Italy (where it is legal to heli-ski) get a transfer (by car or helicopter) to a neighbouring resort where they can drop you at the peak. In some places (such as La Rosiere) you can actually get dropped in Italy and still ski back into France making it easier to get home. If you want an authentic and traditional heli experience then this is a very viable option. Undertake a reverse heli! These are popular in Meribel although we’re not a far drive from the Italian border. Take a ski down off-piste with a guide (they know the best routes!) and end up in the middle of nowhere, for example off the back of La Masse. There are some places who will bring lunch up to you on a ski-do, and then the helicopter will come and collect you and take you home (or to the altiport!). A great alternative way to heli-explore the French regions! We’ll keep our breaths held for the potential re-introduction of heli-skiing into France for now, but I would definitely recommend a reverse-heli or a quick trip to Italy for a day. It surprised me how reasonable it was, with prices I found in a quick google search starting from €250pp including a guide, lunch and the helicopter for a reverse heli. Much more affordable than I’d have expected. And of course, options ranging up in price for even more luxurious experiences!